Born in Dublin in 1958, Stephen Lawlor is a painter and printmaker. He graduated with an honours degree from NCAD and lectured at the Dept. of Fine Art, IADT in printmaking and drawing from 1991-1997. He was chairman of Graphic Studio Dublin, 2000-2005 and became a founder member of the International Academic Printmaking Alliance at the Central Academy of Fine Arts in Beijing 2016. He was on the jury for Masters in Printmaking 2017 and Masters in Painting and Printmaking in 2018 at the Royal Academy of Fine Arts Antwerp. He became an associate member of the Royal Society of Painter Printmakers (RE) London 2016 and a member of Aosdána in 2018. His work evocatively explores western painting and it’s connection with time and the iconography of the human form. Although there is some overlap between his painting and printmaking, they both address pictorial space from figuration to abstraction. 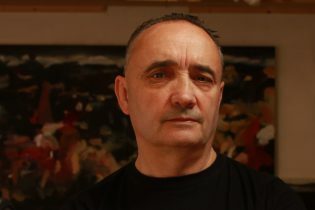 Lawlor’s most recent solo exhibitions were at Oliver Sears Gallery, Dublin, Bourn Vincent Gallery, University of Limerick and Galleri Astley in Sweden. He organised A lonely impulse of delight, (Dublin, Sligo, Beijing, London, Tokyo) in association with SO Fine Art in 2016 and participated in the 6th International Biennial, Center for Contemporary Print, CT, USA, 2018 Impact10 Santander, Spain 2018, Pavillion Art and Design Fair London 2018, Print Rebels, Bankside Gallery London 2018, Paper Contemporary, Sydney Contemporary Art Fair 2017, IAPA, Tiamiao Gallery, Forbidden City Beijing 2016, 8th Douro Print Biennial, Portugal 2016 and 1st International Biennial, Shanxi, China 2012. He is represented in numerous corporate, public and private collections, including:- AIB PLC, Deloitte, OPW, the Ashmolean Museum, Oxford, Biblioteca Catalunya, Spain, The National Self Portrait Collection of Ireland, The British Museum, The Chester Beatty Library, The National Gallery of Ireland, Douro Museum Portugal, the Central Academy of Fine Art Beijing, the Royal Collection, London, the National Print Museum, China and University College Dublin.